Check out this post for more information about RSS. Come on out to Culver’s on Sunday May 28th and share part of your Memorial day weekend with MINI friends. Why: Just to hang out with MINI friends, show off your car, and enjoy butter burgers and ice cream!! This event is open to anyone.. Old Minis, New MINIs, no MINIs. Come on out and have some fun. Randy Webb’s Pulley Party farewell tour makes a stop in Chicago next Thursday May 18th. It’ll be at my garage in Evanston all day and into the evening. However if you want one of the remaining slots, you’ll want to act fast. If you’re interested head over to Webbmotorsports.com and check out all the details! We will be joining forces with the Michigan MINI Motorin Club and attending the Mad Dogs & Englishmen British Car show in Kalamazoo Michigan on Sunday July 9th. The Club’s Board of Directors has decided, after some significant discussion, that the Club cannot sponsor the Michigan wine tour originally planned, or have it be associated with the Club in any way. The liability issues associated with mixing alcohol consumption (however slight) and driving, at any level, are simply too great to allow us to make the wine tour part of the sponsored drive. 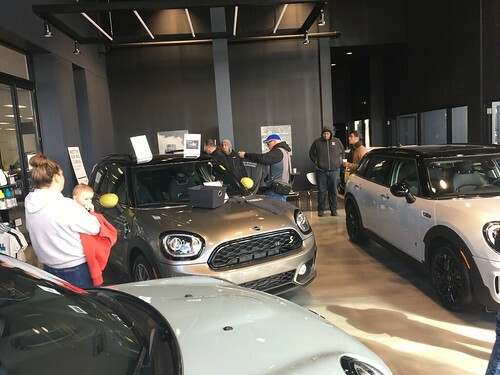 The Milwaukee MINIS Club will be hosting their first event at the Milwaukee Mile on Sunday May 7th. 8:30am in the Walgreens parking lot at Greenfield Avenue & 84th Street, right across from The Milwaukee Mile. Drive on the track together or separately, and afterwards youll be directed to the MINI corral for the car show. Post up if you will be cruising in as a group! !